We’re seeing 2010 as a new start, and one of the big things we’ve all agreed on is that we have too much stuff around that we don’t use, including a big stack of vinyl. Thus the subject of a USB turntable came up, and our problems were solved. These things are great for people who ant to be able to archive their records for whatever purpose. Our reason was that we wanted to keep the music we’d loved while the records were still playable, and then eBay the vinyl so someone else could enjoy it all. It’s worked out well, as we found the things really easy to use and very reliable. USB turntables have been around a while, and are superb ideas for serious music lovers everywhere. Thanks to their ease of use and tthe range of models from the budget variety up to hugely expensive professional editions, everyone can get in on act. Aside from installing some drivers, they’re pretty damn simple to set up, and the results you can get from transferring vinyl recordings to MP3 files are really quite impressive. 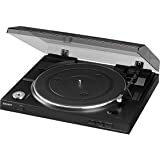 If you’ve got a collection of vinyl you want to keep on enjoying long after the records themselves have either been thrown away or have deteriorated, then looking for one of the best USB turntables is the thing for you. We’re sold.